. From the Drive app on your Android device, you can create a new spreadsheet or edit an existing one. You can switch fonts, resize columns, sort data, and more. And just like on your computer, you’ll be able to see other people’s edits in real time as they’re made. Beyond spreadsheets, you may notice a few other tweaks to the Drive app, including better text formatting when you paste from one Google document to another. And from your Android device, you can edit text within tables in documents and add a shortcut on the homescreen of your device to any specific file in Drive. Whether it’s holiday recipes, shopping lists, or just your family budget, the Drive app on your mobile device makes it easy to get stuff done wherever you are. Get the Google Drive app today on Google Play. You’re making your list, you’re checking it twice -- and now you can do it from anywhere. Just in time for this year’s holiday season, you can edit Google Sheets on your mobile device, just like you can with Google Docs. 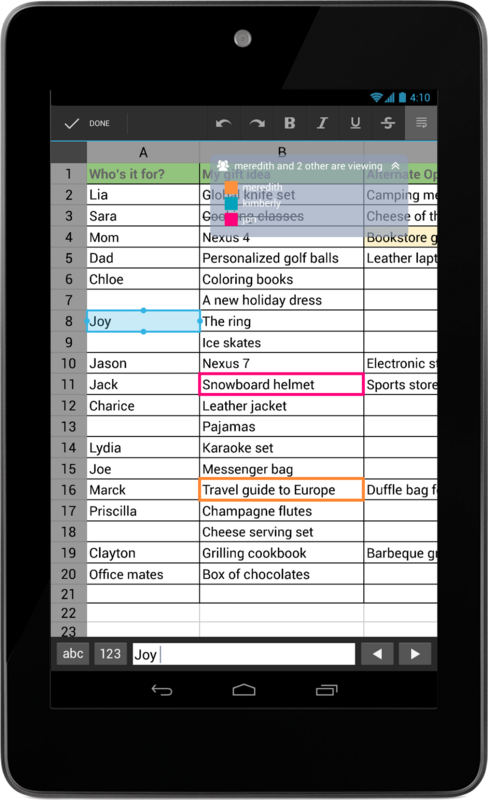 From the Drive app on your Android device, you can create a new spreadsheet or edit an existing one. You can switch fonts, resize columns, sort data, and more. And just like on your computer, you’ll be able to see other people’s edits in real time as they’re made. Four out of five mobile phone and tablet owners plan to use their device for holiday shopping - for comparing prices, locating nearby stores, and searching for coupons. Today, with the launch of Google Shopper 3.0 for Android, you can easily browse for gift ideas, research products, and locate great deals on the go. The app’s redesigned home screen features a bigger search box for easier navigation. When you browse curated gift ideas and latest trends on the home page or search for apparel and accessories, larger photos let you view product designs in more detail. Shopper now makes it quick and easy to find great deals at local and online stores. From the new Sales page, you can view weekly circulars from nearby stores, along with a handful of featured current promotions which you can redeem online or in person. Shopper also shows you store promotions, such as ‘30% off’ or ‘free shipping’, as you search for products in the app. Whether you shop with a conscience or would like a reason to start, Shopper now features GoodGuide ratings, a rating system that indicates on a scale of one to ten whether a product is healthy, safe and environmentally friendly. When GoodGuide ratings are available for a product, you can view these by scrolling down the product detail screen, as shown below. You can learn more about the GoodGuide rating system here. You can download Shopper 3.0 for your Android device from Google Play. As you hit the mall this holiday season, chances are you’ll be accompanied by a reliable personal shopping companion: your mobile phone. Four out of five mobile phone and tablet owners plan to use their device for holiday shopping - for comparing prices, locating nearby stores, and searching for coupons. Today, with the launch of Google Shopper 3.0 for Android, you can easily browse for gift ideas, research products, and locate great deals on the go.